After many years of development, Spectrasonics is proud to release the brand new flagship virtual instrument Omnisphere. This epic 'Power Synth' breaks completely new sonic ground by combining a wide variety of hybrid realtime synthesis techniques, an epic library of remarkable 'Psychoacoustic' sounds, and many innovative features that have never been seen before in any hardware or software synthesizer. The new instrument is the first to be based on Spectrasonics newly developed STEAM Engine. "This is truly an Epic project," said Eric Persing, Founder and Creative Director of Spectrasonics. "We have been working for many, many years; sampling unique sounds, experimenting, specifying the synthesis features and building the STEAM Engine to run it all. It's been a very exciting process involving our team of software engineers, sound designers, musicians, and graphic artists from all over the world. We've been very deliberate in making it easy to use, and yet extremely powerful. Omnisphere is our new flagship synthesizer, and points the way to all our future virtual instruments. We are thrilled to offer a new product that will have a host of expansion capabilities in the future." Although this new synth is extremely powerful, Omnisphere is designed with a unique user interface containing progressive layers of 'zooming' to accommodate the complete range of users - from musicians who just want to be inspired by the sounds and customize them in an easy way, to expert synthesists and the most advanced sound designers. Users can go deeper and deeper into the software and progress in their synthesis knowledge by simply exploring additional levels of sound manipulation options. To make sure that all users get the most out of the new capabilities, Omnisphere includes an extensive set of video tutorials and synthesis lessons taught by the renown Spectrasonics sound design team. Omnisphere offers a host of hybrid synthesis and new control capabilities including Variable Waveshaping DSP synthesis, Granular synthesis, Timbre Shifting, FM, polyphonic Ring Modulation, high-resolution streaming Sample Playback, Harmonia , Dual Multimode Filter structure, Chaos Envelopes , an advanced Unison mode, and the innovative Flex-Mod modulation routing system - to name a few. The huge core library of Omnisphere is filled with years of creative sampling experiments and thousands of inspiring patches. Spectrasonics has pioneered several brand-new types of sampling for the core library of this instrument, including unique "Psychoacoustic" sounds and soundsources created with a new Composite Morphing Technique (CMT) - which morphs the harmonic characteristics of one instrument to another. As a bonus, a section of the core library is also devoted to representing the best of Spectrasonics award-winning sample libraries. When all of these organic core library soundsources are combined with the synthesis power of the STEAM engine, the sounds become "alive" in a truly dynamic and expressive way. Among the many unique features this new multitimbral synth offers are its flexible arpeggiators with the innovative Groove Lock integration with Stylus RMX - allowing the arpeggiator's pattern to instantly groove with the feel of the RMX drum loop; Live Mode for transitionless patch switching and layering, Stack Mode for powerful performance mapping; and integrated modulatable FX Racks. 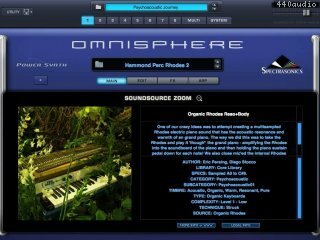 Omnisphere is also the successor to Spectrasonics' popular Atmosphere® instrument, and contains enhanced versions of all the classic Atmosphere sounds. However, the brand new core library in Omnisphere is 10-times the size of Atmosphere and features thousands of completely new and different sounds. * Innovative "Orb" 'circular sound manipulation' interface with Motion Recording and "Dice" button for infinite variations and one-touch sound customization. o Harmonia: New zoom page shows all Harmonia parameters per layer adding up to 10 oscillators per patch with new independent modulation options for Levels and Fine Tuning on each Harmonia oscillator. o Waveshaper: New zoom page with extreme new processing modules including polyphonic 'Crusher' and 'Reducer' sections with 'Force' and 'Animation' controls that can all be modulated. o Granular Synthesis: New 'Speed' and 'Position' modes. New zoom page with new 'Granular Visualizer' showing a graphic model of the effect of parameter edits which makes Granular synthesis easier to use. * Patch Library Update: Over 700 brand new patches created by renowned Spectrasonics sound development team gives Omnisphere over 5,000 patches and 8,000 total sounds. * New 5-Column Browser view displays more sound categories and attributes simultaneously. * New Online Video Tutorials for Version 1.5 capabilities. * Support for new 'Omni TR' iPad app. * New "Recently Added" Browser sorting option. * Added support for MIDI devices which send polyphonic aftertouch. * New 'Clone Part' feature allows easier editing/setup with multichannel MIDI controllers. * New MIDI Learn hardware control mode follows Live Mode selection. * Modulation Envelope points can be key-command snapped to semitone when modulating pitch. * User-assignable Legato Interval rule added. * FREE update for registered users of Omnisphere. New "Latch" performance features for Live Stack modes allow notes from any part to be "frozen"
Omnisphere software version 1.3.0 or higher is REQUIRED to use this Patch Library or the patches will not sound correct. 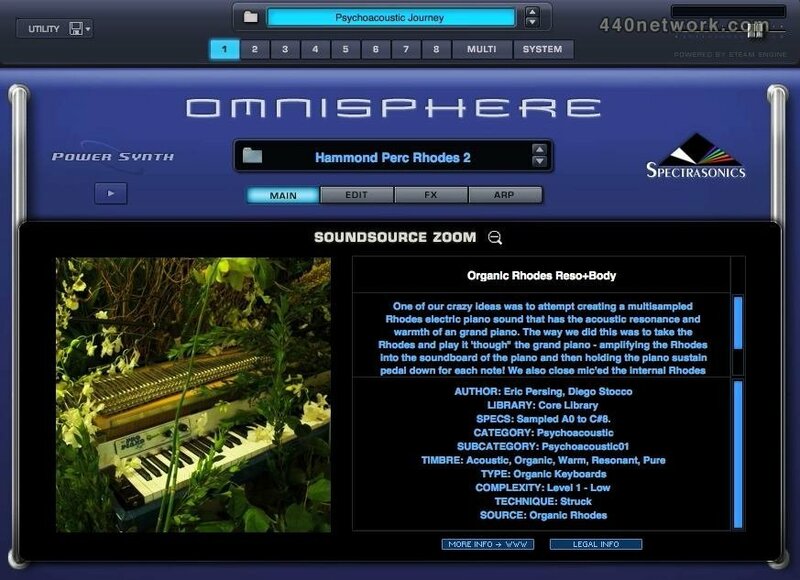 Omnisphere Software version 1.2.0n or higher is REQUIRED to use this 1.2.0 Patch Library. If you don't have v1.2.0n or higher of the plug-ins installed, the patches will not sound correct. Don't display inverted note learns on Live page. Prompt for STEAM folder when STEAM shortcut is missing. 64-bit native support on Windows. Support for new STEAM engine features introduced in Trilian, including: Round Robin soundsources, Release layers, Multichannel soundsources, Legato articulation triggering. Memory Management features: Lite Version feature, sample thinning, training/purging for maximizing efficiency and faster loading/auditioning. Support for maximum number of RTAS processors in Pro Tools. Required install for compatibility with Omnisphere 1.1.3c or higher. Fixes a problem with creating/deleting Omnisphere repeatedly during a Receptor session. Multiple outputs sometimes generate noise in Cubase. Moving STEAM folder would break user tags. Parameter value display values for LFO Hz were incorrect. Effects would not always reset when resetting transport in Logic. Sample start envelope incorrect under some circumstances. Problem in Power Filter when used in multiple instances simultaneously. Support for the 1.0.3 Patch Library. Thumbnail images for small soundsources don't always update properly on Windows. Graphics artifacts when stepping through soundsources while details are displayed. MIDI learn clone and omni don't work with note MIDI learn. First arpeggiator note doesn't always trigger when looping in host. Problem with deep FM in synth mode when playing in a high register. Chorus echo noise at high sample rates and when changing tempo. Live touch mode for MIDI CC not working properly. Clicking in Radio Delay effect. Multis saved in Live mode would sometimes open in Stack mode. - Aftertouch mod controller preference can't be reset to aftertouch. - Master and aux effects racks don't have sample rate set properly. - MIDI Learn of attack and release on Main page doesn't work. - Tuning scale doesn't reset upon patch restore in some cases. - Patch saving fails when STEAM is in a folder called Omnisphere Library. - Legato LFOs should not be retriggered with each Arpeggiator note. - Need Part Clear on Utility Menu. - MIDI Note Learn problem in Live Mode. - Multi browser may step down to next item when host loads a multi while Multi browser is displayed. - Startup performance problem with preset menus on some systems. - Arpeggiator problem when closing plug-in window. - Auto chaos not working for non-looped envelopes. - Streaming preferences incorrectly initialized. - New Value Option text field doesn't disappear after entering text in AU hosts. - Part names get restored when loading a midi learn template. - Startup time affected by files in temp folder. - Error message when a subcategory folder needs to be selected for a save isn't clear enough. - Tuning scale menu check marks don't restore properly. - EZ-Phaser parameters dont have "EZ-Phaser" prefix in mod-matrix target menu. - Patches that use tuning files in nested folders are not sharable. - Keystroke handling in Logic interferes with key commands. Now that I had a little chance to poke around...this is one INSANE update!!! 'The Orb' is going to be an incredible sound design tool, revealing and extending the accessibility of Omnispere's true power to us mere mortals. Unfortunately this all comes while I am battling an ear infection and now maybe the flu but even those havn't stopped me from being blown away with some 'sick break' experimentations. Please note, the 'Update' function in Omnisphere itself didn't work last time I tried, you need to go to the actual 'Updates' page on their site and manually get it. Also make sure you pay attention to the proper install order. Le synthé que j'utilise quasi exclusivement depuis plus d'un an alors que j'en ai pourtant un bon paquet d'autres. Je ne m'en lasse pas. Gros sons de rêve. Depuis l'achat il y a eu de nombreuses mises à jour gratuites importantes, tant au niveau de fonctionnalités inespérées ou inattendues (comme OmniTR qui communique avec l'Ipad) que des banques de sons. Le créateur d'Omnisphère, Eric Persing, est un sound designer de génie auquel on devait déjà de magnifiques choses lorsqu'il officiait pour Roland par exemple. Pour vous faire une idée de ce que ce synthé peu faire, recherchez sur le site de Spectrasonics (ou Youtube) les démos du précité, voire mieux encore celles du cultissime Jordan Rudess.